Editor’s note: News of this announcement appeared on BioSpace, BioTuesdays PRNewswire, Times of Israel, and Yahoo! Finance. Vessi Medical announced a successful animal study demonstrating the use of its surface cryoablation therapy inside the urinary bladder. 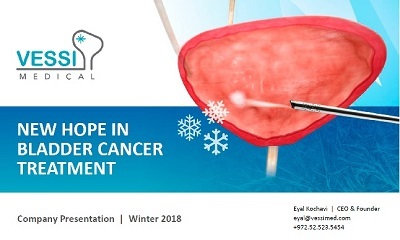 Vessi’s minimally invasive solution introduces an alternative for the treatment of non-muscle invasive bladder cancer (NMIBC). Vessi’s bladder-specific cryoablation technology seeks to eliminate problems often reported with Transurethral Resection of Bladder Tumor (TURBT), today’s first line of treatment. Vessi’s minimally invasive cryoablation solution for NMIBC addresses an initial market estimated at $1.2 billion. Categorized as surface cancer on the inside lining of the bladder, NMIBC affects 2 million people globally, with 300,000 new cases reported annually. The porcine model study was performed on three subjects, each with 2 to 4 targeted ablation sites in the bladder. Five days post treatment, the histology demonstrated localized, focused ablation on the target sites, without damaging untargeted tissue. The patent-pending Vessi system — inserted transurethrally into the bladder — includes a cryo-spray designed for the bladder’s unique environment. The system balances the ideal cooling temperature and pressure for targeted cell destruction, while protecting the untargeted bladder tissue. The procedure, aimed to be administered in an office or outpatient setting, is designed as an intuitive “same-style” TURBT procedure for efficient user adoption. Prof. Gilad E. Amiel, Department of Urology Chair at Israel’s Rambam Health Care Campus, performed the procedures. Surface cryotherapy is a potential paradigm shift in the treatment of superficial bladder cancer. Tissue response to the cryo spray can be seen in real time, allowing physicians to assess destruction of the tissue. Visualization was excellent at all procedure stages and was not affected by the cryo spray. Additionally, histology results demonstrated the efficacy of tissue destruction and safety as there was no revealed bladder perforation or bleeding. The trial results provide Vessi with the necessary data and confidence to proceed to first-in-human trials. Our successful animal study is an important step toward making cryo-spray ablation a significant tool for the treatment of superficial bladder cancer. Our next step is demonstrating the technology in humans prior to regulatory submission. Vessi’s technology focuses first on bladder cancer, but can hopefully address other bladder illnesses such as overactive bladder, providing a win-win solution for patients, physicians and the health care system.